A storm is brewing in North Warrandyte after Nillumbik council granted planning approval for a residential building at 2 Pigeon Bank Road. At a meeting of the Future Nillumbik committee on March 14, five out of seven councillors voted to approve the plans, going against the recommendation of the council planning department. The land in question is a pristine, steep riverine bush-block in an extremely environmentally sensitive area. Architect Phillip Mannerheim purchased the block in 2014 and has plans to build an eco-friendly sustainable home on it for his retirement. The property is one of eight blocks in a low density or bush land residential street that is well serviced with existing infrastructure, including sealed road with reticulated water, power and sewerage. There was just one objector, a neighbour, who was not objecting to the development but wanted better separation and screening from his property. There are multiple parties both for and against this development. The land is unique in having four distinct native plant communities supporting diverse wildlife populations. The planning sets a disastrous precedent which could see the end of the “Green Wedge” as we know it. 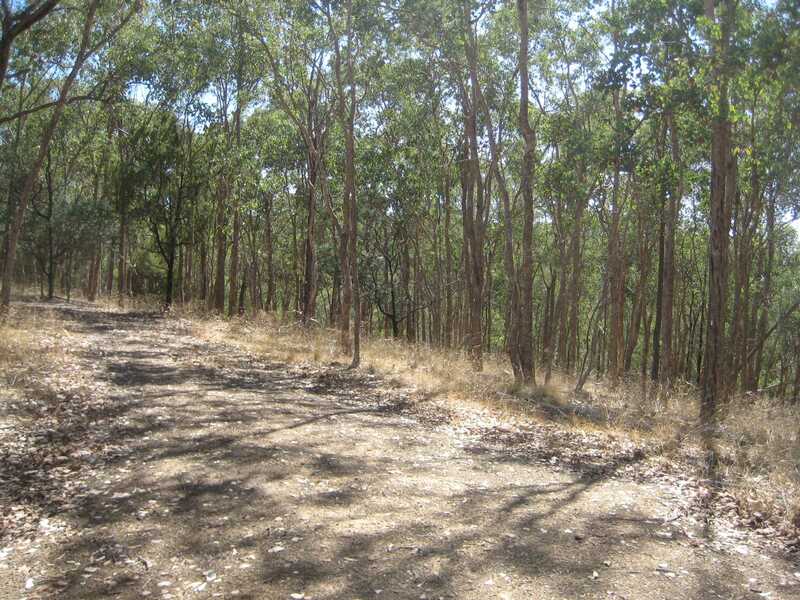 The decision, against the recommendation of experienced Nillumbik Planning Officers to reject the planning application, will see the destruction of at least 746 trees to build a house and out-buildings on a ridge, creating a visual eyesore and threatening the nearby Koornong State Park bushland. At 5.3 hectares, the block is smaller than the eight hectare minimum subdivision required under Rural Conservation Zone (RCZ) Schedule 3. Clause 35.06 of Nillumbik’s own planning scheme requires use of land to protect and enhance the environmental and landscape value of the land — This proposal does the opposite. Rural Conservation Zoning seeks to ensure that “the existing character, landscape quality, view-lines and other natural environmental characteristics of the area are protected and enhanced in an equitable and sustainable manner”. The proposal also contravenes other clauses and overlays in the Nillumbik planning scheme. The “Stranded Asset” argument, that a landowner has a reasonable right to build on such a site has no validity as RCZ zoning was introduced as early as 1973 and any land purchaser should conduct due diligence on any property before purchase. The nearby Koornong land was purchased by the State in 1979 after an intensive campaign by the Warrandyte Environment League, supported by the Warrandyte Diary, to save it from destruction by inappropriate housing development. Council has apparently identified about 700 similar undersized blocks which could be opened-up for development in Nillumbik. This would destroy the Green Wedge and Nillumbik as “The Green Wedge Shire”. To use the land for a dwelling on a substandard sized lot is not consistent with the intended purpose and decision guidelines of the RCZ. Does not seek to use the land to protect and enhance the environmental and landscape value of the site. Is not consistent with clauses concerning green wedges, vision strategic framework, settlement and housing and rural land use. Does not respond to the decision guidelines of the RCZ, and siting and design policy, for buildings and works in non-urban areas, due to the level of site disturbance required for the construction of the dwelling, and the associated conservation and environmental impacts. 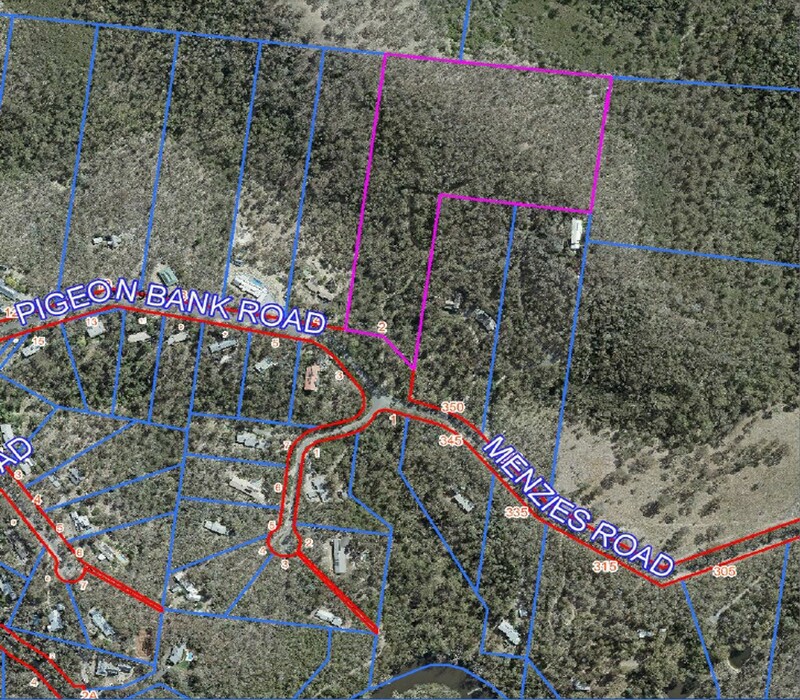 Has not adequately responded to the objectives and decision guidelines of the bushfire management overlay and wildfire management policy as the development of the land; a dwelling will pose a threat to life and property, is inappropriately sited, requires an impractical level of maintenance — in light of the site’s topographical features — and is deemed unsafe. Is not responsive to the objectives and decision guidelines concerning native vegetation in that the proposal has not adequately considered the role of native vegetation as both habitat, and playing a crucial role in minimising land degradation. Has not adequately responded to the objectives and decision guidelines of the environmental significance overlay in terms of the potential to detrimentally impact on the environmental values of the land due to the proposed vegetation removal. Will not result in an acceptable planning outcome as outlined in the decision guidelines having regard to the orderly planning of the area, the degree of fire hazard for the proposed development, the extent of vegetation proposed to be removed, and the potential land degradation and erosion. Jane Ashton was one of five councillors who supported the development. She spoke at length to the Diary, and these are her main points. The decision was not made lightly; I did a considerable amount of research beforehand with regard to the design, the CFA reports and the environmental studies performed. The block has a house number and kerbing for the driveway. The Department of Environment and Land did not object and said the development “is not expected to have a significant impact on any rare or threatened species”. 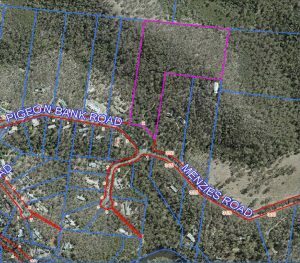 The applicant commissioned 5 ecological surveys, has agreed to 4.5 ha becoming Bushland Conservation Zone and is providing $80,000 of offsets. The applicant is an experienced architect. The home has solar panels, a 500,000 litre water tank for bushfire survival and is recessed into the ground to minimise any visual impact and reduce the footprint substantially. The application meets all bushfire risk management requirements and the design displays excellence in satisfying CFA requirements. The block is very heavily treed having over 5,000 trees, many of which are small. The 750 trees mentioned are mainly saplings and very immature trees with a girth less than 50cm, there are very few mature trees and no “significant” trees. The number of mature trees impacted is likely to be less than 100 in total and, as with the other houses in the street, removal is necessary to provide a defendable space around the property. The applicant has committed to connect to the sewer at considerable distance and expense, even though this is not a requirement. The eight-hectare minimum lot size mentioned by critics is for subdivision planning only and is not relevant to this application as the area has already been subdivided. Under RCZ Schedule 3, dwellings are not prohibited, the land is in private ownership and is not reserved for conservation purposes. I firmly believe that we do not own the land, the land owns us; we are the guardians. Friends of Nillumbik should embrace the applicant with open arms and help him tidy up the understory and remove the 17% of introduced species from his block. I am of the opinion that the applicant will be an impeccable guardian of this precious land. The 5.3 hectares contains habitat of high conservation significance, almost a hectare of vegetation will be cleared including the loss of 746 trees. A ridge top will be extensively cleared for the house so landscape values will be seriously degraded. It is intended to use the land for rural residential purposes, a use at odds with its rural conservation zoning. Councillor’s Brooker and Dumaresq opposed issuing the permit urging respect for our planning scheme. This irresponsible council decision shows that the purpose of Nillumbik’s Green Wedge has been purposely questioned by councillors. Nillumbik was created to be “the conservation shire with the Green Wedge as its strategic focus”. The bulk of Nillumbik’s Green Wedge was given protection under the Rural Conservation Zone (Schedule 3) of the Planning Scheme and the later placement of the Urban Growth Boundary (UGB) reinforced this demarcation separating planned residential land from rural land. The government’s intention to protect our Green Wedge was given further emphasis when it required any rezoning proposal affecting Green Wedge land to be passed by both houses of the Victorian Parliament. This permit application has brought into sharp focus the application of Nillumbik’s Scheme. The north side of Pigeon Bank Road is outside the UGB, is zoned Rural Conservation Zone (RCZ3) and there is no mention of residential use in the zone purpose. In fact for the RCZ it is all about protecting the natural environment, landscape, faunal habitat and cultural values including biodiversity of the area and ensuring that land use changes do not have an adverse impact on these. The removal of close to a hectare of bushland, including the destruction of 746 trees and the clearing of a landscape-sensitive ridge top, is not consistent with these zone requirements. It is up to a purchaser of land to consider all restrictions which may affect future plans; hence the need for a permit. “This is to be a home for my retirement. “I jumped through various hoops, hurdles, ecological surveys and assessments required by council, at considerable expense. “At their suggestion, the plans have already been changed so as to relocate down from the ridge top and the driveway redesigned for fire truck access. “It was therefore quite dismaying to receive a recommendation from the planning department which was totally negative, and amounted to a statement to the effect that this land was unsuitable for a building. “I cannot understand why my block is being singled out for special treatment, as all the other blocks in the subdivision contain houses and the planning regulations have not changed. “Fortunately, Mayor Peter Clarke, himself an architect and with considerable experience as a Councillor at Melbourne City, saw my point of view and four of the other six councillors agreed with him. “I am trying here to achieve a 10-star energy rating with innovations such as tracking the sun, insulation, and recessing part of the home into the ground; all designed with world-leading conservation values in mind. “I am surprised that so-called conservation and community groups would be against this development, when what I am proposing should set an example to Australia on how to build sensitively and efficiently in the bush while protecting and enhancing the environmental and landscape value of the land”. Not being an original objector to the proposal Warrandyte Community Association is unable to lodge a direct case at VCAT. However — as we go to press — we learn that it is considering whether as an “Affected Person”, it will apply to VCAT for leave under Section 82B of the Planning and Environment Act 1987 to apply for a review of Nillumbik Council’s decision. This year’s Australia Day saw a clutch of honours go to local Warrandyte residents. We welcome Warrandyte’s newest member of the Order of Australia, Judy Lazarus (AM), Her citation commends her for significant service to the community through social welfare groups, notably through custodial rehabilitation and resettlement initiatives. 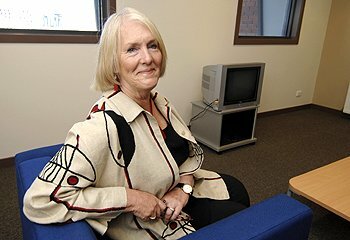 She has been involved in a variety of services, including Victorian Association for the Care and Resettlement of Offenders, Beechworth Correctional Centre, Association of Neighbourhood Houses and Learning Centres, Beechworth Health Service, Women’s Correctional Services Committee, and the Ministerial Community Advisory Committee – Prison Leaves and a Non-Government Sector Representative for the Corrections Victoria Stakeholder’s Forum. Judy has also been a recipient of a Churchill Fellowship, and has had the Judy Lazarus Transitional Centre named in her honour. Also receiving a national honour for meritorious service was Warrandyte local Paul Wilkinson who received an Ambulance Service Medal (ASM). Mr Wilkinson has been a paramedic with Ambulance Victoria for over 32 years and throughout his career has focused on developing paramedics and improving workplace health and safety. His citation noted that “He has consistently demonstrated a selfless attitude and dedication to improving the lives and well-being of his colleagues. As a Clinical Instructor, he worked to mentor and instruct graduate paramedics to develop and build their clinical skills, and provide a strong ambulance service to the community”. The Menzies community awards were handed out by local federal member Kevin Andrews, who saw the occasion as one to celebrate the grassroots achievements in our community. “If only we knew what people in our community do, it is only on occasions like this that we find out,” said Mr Andrews. The Menzies Community Awards saw two Warrandyte recipients. Pam Booth received an award for her contribution as a volunteer at Information Warrandyte for a total of 13 years. Ms Booth’s citation describes her as a “dedicated and reliable volunteer who capably assisted visitors and clients. She also contributed to Information Warrandyte’s Directory of Services and maintained the Community Centre Public noticeboard. Pam has been a long time Warrandyte resident, local kindergarten teacher and Warrandyte Tennis Club member”. 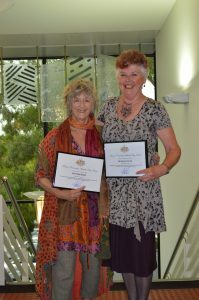 Denise Farran was recognised as a valued member of the Warrandyte community, working with the Neighbourhood House Committee of Management and as a Film Society member and volunteer. She was also recognised for her volunteer work at the Tarrawarra Gallery and for events at the Warrandyte Arts Association and Festival. Denise Farran was very surprised to receive her award, especially after accidentally mistaking her letter as junk mail – but fortunately she managed to recover her invitation. “The award was a surprise and a real treat,” she said. Menzies Awards were also given to the parents of local identity Peter Fraser, whose father Malcolm Fraser and mother Beverley Fraser were both recognised for their work at St Mark’s Anglican Church in Templestowe. On a warm November Sunday 200 fire fighters from 30 brigades descended on Warrandyte to train for responding to several of bush fire scenarios that could affect the area in this coming summer. A series of exercises were conducted by volunteers from Warrandyte and Wonga Park and volunteers and career staff from the integrated South Warrandyte brigade. Maroondah Group training manager Lt Will Hodgson said fire fighters from neighbouring areas were given an idea of the challenges faced where the Green Wedge meets metropolitan Melbourne. The crews experienced scenarios from protecting houses in the difficult terrain of North Warrandyte to supporting a Place of Last Resort where hundreds of residents may take shelter from an oncoming bush fire. Lt Hodgson said the logistical support of Manningham City Council and the Salvation Army allowed for a realistic exercise which gave the brigades a chance to prepare for summer. “We are making sure the fire fighters’ skills are ready to go for summer and to give the crew leaders and strike team leaders the opportunity to plan for what they are going to do if they are tasked to provide asset protection in the greater Warrandyte area,” he said. Warrandyte CFA captain Adrian Mullens said CFA volunteers and career staff were working together to protect the Warrandyte Community this fire season, and all year round. “The South Warrandyte career staff are able to turn out to inci- dents quicker than the volunteers, but we will always be out supporting the community with them,” he said.